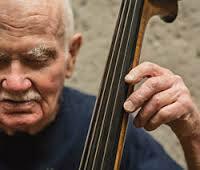 I just heard that Ron Crotty, the original bassist of The Dave Brubeck Quartet, died just a few days ago, too, but I have not seen anything written about it. Which leads me to ask, has Ron passed? Or is it another case of the internet burying someone who is still with us? The sad report that Derrick heard was accurate. Evidently, nothing has been written in the jazz press or in general news outlets about Crotty’s death. Guitarist Tony Corman, his frequent playing companion in recent years, confirmed it for us by email. Ron was diagnosed with pancreatic cancer on his 87th birthday, Apr 2, and passed three weeks later. He’d been treated for cancer two years ago and came through a rather grueling treatment pretty well, and we resumed playing our steady Sunday gig at the Oakland Museum. He was gardening again and had a new love relationship, really was doing fine, and then started feeling lousy, went to the doc, and, well, there you are. We’re looking to do a remembrance at the Oakland Museum on June 28, 3 – 5 PM. I couldn’t find an obit either, nor were we told of a funeral. Ron has one daughter, who lives I think in D.C. She was (and may still be) out to see him at the end and, I presume, take care of his affairs. Six years before his deathnearly to the dayRifftides posted a piece about Crotty. 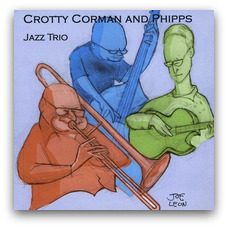 It contained video of Crotty, guitarist Corman and bass trombonist Frank Phipps playing at the Oakland Museum. With the elimination of a bit of introductory rambling, here it is. What Ever Happened To Ron Crotty? Ron Crotty was the bassist in the Dave Brubeck Trio of the late 1940s and early ’50s and the quartet that Brubeck and Paul Desmond formed in 195l. 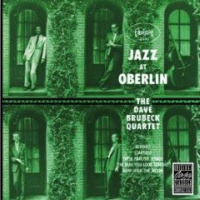 On the cover of Brubeck’s celebrated Jazz at Oberlin from 1953, he is lounging in the lower right of the photograph. Crotty’s influences were Jimmy Blanton and Ray Brown. At the age of 80, that’s how he plays today, with solid time, a big tone, the best notes in any given chord, no acrobatics high on the finger board, no triple stops and no blinding double-time passages. With Crotty on the new CD are men he plays with in his gigs in the café of the Oakland Museum, the clubs called Anna’s and Sadie’s and other spots around the Bay Area. They are bass trumpeter Frank Phipps and guitarist Tony Corman. How many important bass trumpeters can you name? I can think of two in addition to Dizzy Gillespie, who dallied briefly with the instrument. They are Cy Touff and Johnny Mandel. Mandel played bass trumpet briefly with Count Basie, then went on to other work. Add Phipps to the list. Cat can play. So can Corman. Phipps has a lovely way of alluding to extracurricular tunes without quoting them outright. Why is he shown on the cover playing a trombone? I don’t know. In this clip from YouTube, they play “Witchcraft.” The sound is on the verge of distortion, but the video gives you a look at the group. Corman goes beyond allusion in his quote from John Lewis’s “The Golden Striker,” but he makes it fit so nicely that he can be forgiven. A pleasure to read this extensive and informative follow-up to the sad news of Ron Crotty’s passing. As you so often do, you’ve cast a light on the life of a musician who deserves to be recognized…and you do it so well. Thanks. Ron Crotty was a very close friend of mine for over 41 years. We played lots of gigs over the years. and shared many moments over what seems like a lifetime. I saw Ron at his apartment the day before he passed away. I’m glad I had the chance to see him that evening. Ron was a very important person in my life since I was in my twenties. When we first met, I was 24 and he was 44. I played at the Oakland Museum with him every Sunday for five years. It was a bass and guitar duo. Actually, Ron was 86 years old on April 2nd. I never met anybody like him. He was one of those unforgettable characters you rarely run into in life. No doubt, Ron’s other close friends all know what I’m talking about.